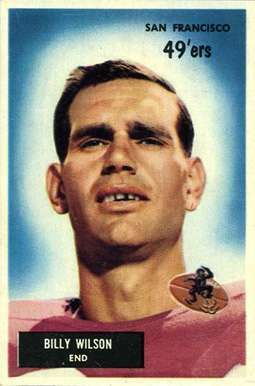 Billy Wilson (February 3, 1927 – January 27, 2009) was an American football wide receiver who played for the San Francisco 49ers from 1951 to 1960. He was named to the Pro Bowl six times. Born in Sayre, Oklahoma on February 3, 1927, he moved with his family to California at the age of three as his parents sought to escape the Dust Bowl that was sweeping through the prairies during the Great Depression. He attended Campbell High School and enlisted in the United States Navy during World War II. Y. A. Tittle, a quarterback whose time with the 49ers matched up with Wilson's, called him "one of the fiercest competitors I ever played with" and described him as "our No. 1 receiver." "Whenever we needed a big catch, I went to him because I knew he would make the play." Bob St. Clair, an offensive tackle who played with Wilson for eight seasons in San Francisco, reflected on his ability to catch balls with "hands of glue" and run with the ball after making catches, calling him "probably one of the most underrated players in N.F.L. history." Former defensive back and Pro Football Hall of Fame coach Don Shula recalled "a play Billy made when he caught a pass, leaped straight up into the air over myself and two other defenders, and ran it in for a touchdown", describing Wilson as "one of the few players of another era that would excel today." He was one of the first 49ers players to make an impact in the NFL as a receiver, with his career accomplishments all the more remarkable in an era before rule changes that increased passing and 12-game seasons, and playing for a team whose "Million Dollar Backfield" led by Tittle focused on the running game. Though considered an equal of Hall of Famers Raymond Berry, Tom Fears and Elroy "Crazylegs" Hirsch, Wilson has not been inducted into the NFL's Hall, although former 49ers coach Bill Walsh led an advocacy effort on Wilson's behalf. Walsh called Wilson "the top pass receiver of his time and one of the finest blockers". Walsh said "As I've seen the men inducted into the hall, including myself, I've thought that Billy certainly should have been enshrined some years ago." After retiring from the playing field, Wilson spent 30 years working for the 49ers as an assistant coach and scout. Wilson died at age 81 on January 27, 2009 in Carlsbad, California. He had been at a hospice center, where he died of bone cancer. He is survived by his wife, two sons, two daughters, a brother and seven grandchildren. 1 2 3 4 5 FitzGerald, Tom. "Ex-49ers receiver Billy Wilson dies at 81", San Francisco Chronicle, January 28, 2009. Accessed January 29, 2009. 1 2 3 4 5 via Associated Press. "Billy Wilson, Sure-Handed Receiver for 49ers, Dies at 81 ", The New York Times, January 28, 2009. Accessed January 29, 2009.